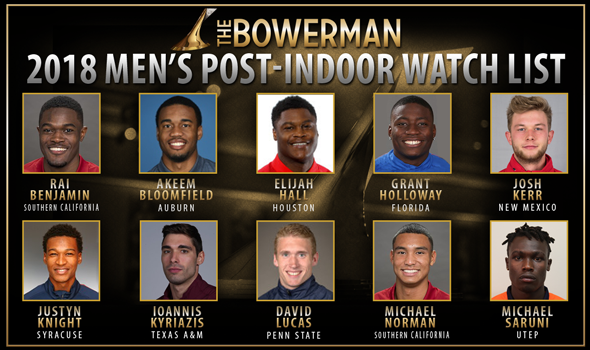 NEW ORLEANS – If an athlete’s name is on the Men’s Post-Indoor Watch List for The Bowerman, it means he did something outstanding at the 2018 NCAA Division I Indoor Track & Field Championships or – in John Kyriazis‘ case – is ready to tune up the band for the start of a potentially record-breaking outdoor season. Nine of the men on the newest index for collegiate track & field’s highest honor fall in the first category: Southern California’s Rai Benjamin and Michael Norman, Auburn’s Akeem Bloomfield, Houston’s Elijah Hall, Florida’s Grant Holloway, New Mexico’s Josh Kerr, Syracuse’s Justyn Knight, Penn State’s David Lucas and UTEP’s Michael Saruni. David Lucas JR Penn State Throws Lititz, Pa.
Also Receiving Votes: KeAndre Bates (Florida), Trey Culver (Texas Tech), Tim Duckworth (Kentucky), Mostafa Hassan (Colorado State), Chris Nilsen (South Dakota), Divine Oduduru (Texas Tech), Will Williams (Texas A&M). Norman starred in College Station, Texas as he broke the world record in the 400 and ran the anchor leg of the Trojans’ 4×400 team that set an all-time world best. The sophomore from Murrieta, California, clocked a time of 44.52 in the open 400 to top the older standard of 44.57 and then split the same time in the relay to propel Southern California to victory in 3:00.77. You can’t talk about the record-setting Trojan quartet without mentioning Benjamin. The junior from Mount Vernon, New York, notched the fastest split time in world history (44.35) less than an hour after finishing third in the 200 finals. Hall and Holloway were also in the final section of the 4×400, but it was what they did prior to their two laps that had everybody talking. One year after 2017 The Bowerman winner Christian Coleman set the same track on fire in the 60 and 200, Hall one-upped him. Hall became the fourth man in NCAA DI history to sweep the short sprint titles indoors and broke the collegiate record in the 200. The senior from Katy, Texas, ripped through one lap in 22.02, which also stands as the American record and second fastest time in world history. Holloway, who did turn in a split time of 44.91 for the Gators in the 4×400, defended his title in the 60 hurdles and placed second in the long jump. The sophomore from Chesapeake, Virginia, became the only man in world history to go sub-7.50 in the hurdles and eclipse 8.00m (26-3) in the long jump – and he did it within 24 hours of each other. Saruni did just enough to qualify for the final of the 800 and then went to work under the bright lights. The sophomore from Ravine, Kenya, blew away the field over the final 400 meters and stopped the watch at 1:45.15 for the meet record and the second fastest time in collegiate history. Kerr started the final day of the meet just like he did last year – with a win in the mile. The sophomore from Edinburgh, Scotland, is the first man to capture back-to-back mile crowns since fellow Lobo Lee Emanuel in 2002 and 2003. Bloomfield finished runner-up to Norman in the 400 and turned in an all-time top-10 mark in the process. The sophomore from Kingston, Jamaica, crossed the finish line in 44.86, which is the fourth fastest in collegiate history and makes him the sixth man to go sub-45 seconds on a regular-sized track. Knight remained on the Watch List following an individual title-winning effort in the 5000 and a runner-up showing the 3000. The senior from Vaughan, Ontario, unleashed a tremendous kick and closed the final lap of the 5000 in 27.54. Lucas is the fourth male athlete from Penn State to be included on the Watch List over the years and justifiably so. The junior from Lititz, Pennsylvania, broke the facility record in the weight throw and won the individual title in 24.02m (78-9¾) after entering the meet with the fourth-best seed mark. A number of men received votes, but not enough for their name to be included on the Watch List: Florida’s KeAndre Bates, Kentucky’s Tim Duckworth, Colorado State’s Mostafa Hassan, South Dakota’s Chris Nilsen, Texas A&M’s Will Williams and the Texas Tech duo of Trey Culver and Divine Oduduru. The next Men’s Watch List will be released on April 19. Watch List Odds & Ends: The SEC now has 240 total Watch List appearances, which is just 12 less than the Big 12 and Pac-12 combined … Southern California becomes the fifth men’s program in Watch List history to have five or more athletes listed over the years … Among current collegians who have been on the Watch List this year, John Kyriazis moves into a tie with Chris Nilsen for the most appearances with nine. Grant Holloway and Josh Kerr each have eight to their name.